My summer was rather packed with fun things, and while busy having fun, I didn’t have time to update you about everything. Like going to Hawksmoor for the first time and loving it. Linus, a friend from home whom I have known since secondary school, came to visit during the Olympics. When trying to decide where to go for supper one evening, I asked him what type of food he would like. The answer came quicky: – Meat. I have been wanting to go to Hawksmoor for ages and saw my chance, and managed to book a table for the following day. As most Londoners I expected London to be super busy during the Games, and thought it almost impossible to get a dinner reservation with short notice. This was not the case, however, when we got to the restaurant in the City on a Friday night it was far from full and the staff said that it was very quiet during the Olympics. Once seated at our rustic dark wood table, both Linus and I couldn’t help but drool over the massive steak at the table next to us. It was a moment of ‘We’re having what he’s having’, after takling to the knowledgable waitress about the different cuts. 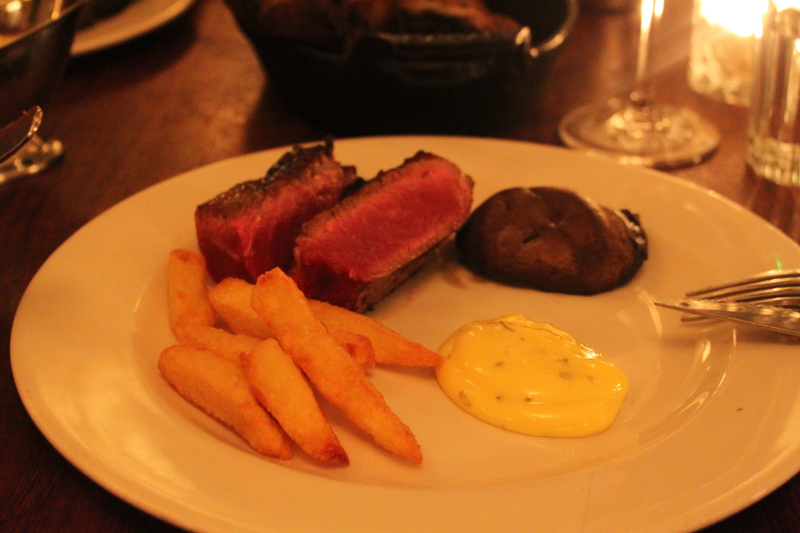 Our neighbour had a Porterhouse steak, so we had one too, to share as it weighed in at 900 g.
We also had crispy delicious chips, the best bearnaise sauce I’ve ever had in a restaurant (and it was a generous portion too), fried portobello mushrooms and a bottle of red. With that much meat we ate slowly to be able to really enjoy it and finish it. We both really enjoyed this meal. The restaurant has a relaxed atmosphere, the grub is really good, the meat amazing (so full of flavour) and the staff both knowledable, pleasant and a little laid back. 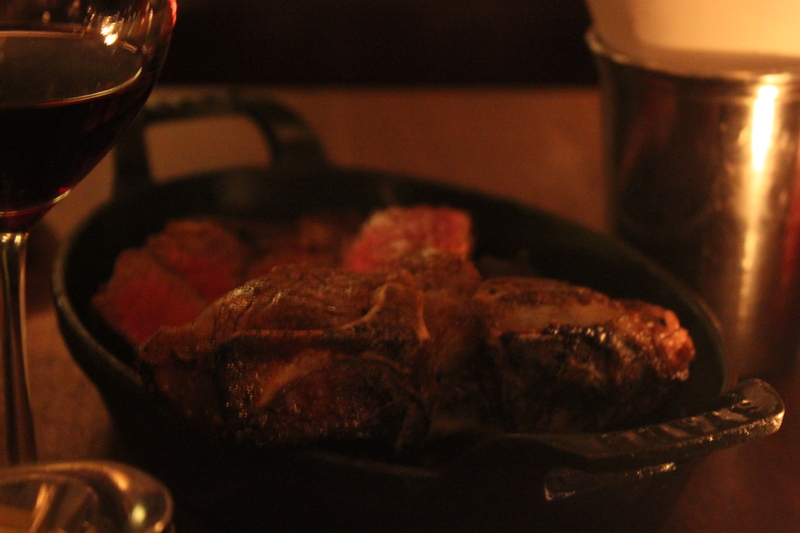 There are plenty of steak restaurants in London and without trying them all, I think I can say that Hawksmoor is definitely up there with the best ones!